Hayes High School senior Alison Alsup poses with her painting “Three Generations,” which depicts Alsup, her mother, Janet Alsup, and her grandmother, Yoshiko Shevis, at approximately the same age. Alison said the pieces contains dates and locations of where the pictures the painting is based on were originally taken, and she added the pieces are about the beauty of family history. 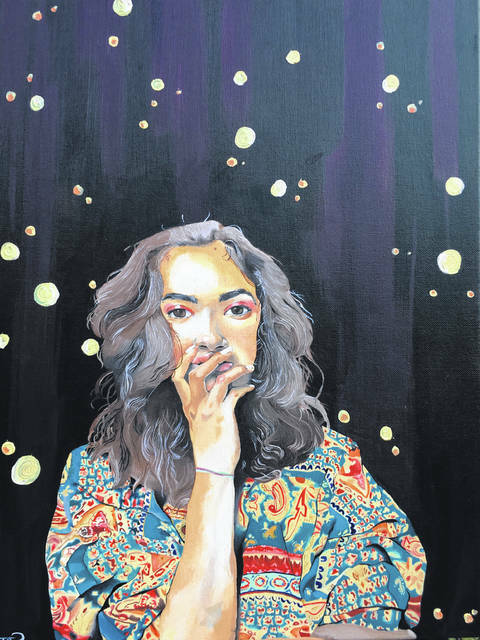 “Self Portrait at Seventeen” is a piece painted by Alsup that is currently featured in the regional division of the Governor’s Art Show. “A Portrait of Karl” is a painting that Alsup made as a class project. The painting has since been featured at the state level of the Governor’s Art Show, much to Alsup’s surprise since it was something she did for class. 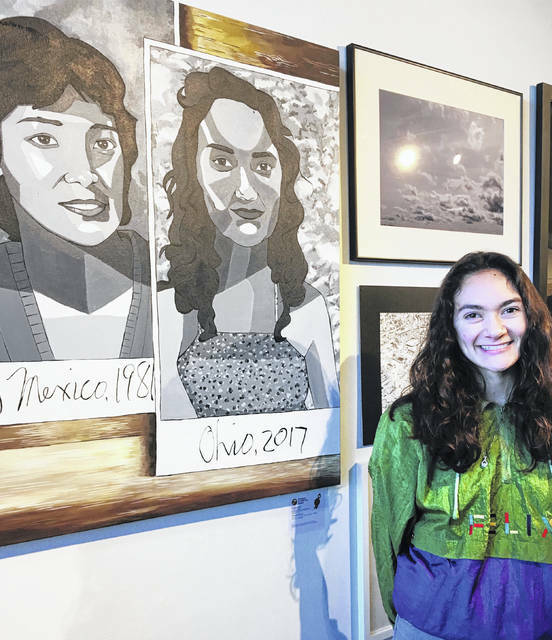 A Hayes High School senior recently took home several Scholastic Art and Writing Awards, including three gold keys, the highest honor in the competition. Alison Alsup said she’s been drawing and practicing art since she was a child and would watch her mother paint. Alsup added she had never taken part in an art contest until a teacher submitted a piece of her artwork two years ago. Alsup said “Johnstown Pennsylvania” and “Three Generations” were then entered in a national contest, and both pieces earned silver medals. Alsup said she was proud that “Three Generations” was featured, because it is a piece she has worked the hardest on. The painting also contains dates and locations where her mother and grandmother lived when they were her age. Alsup added she’s had pieces commissioned by staff at Hayes, including the tickets for the upcoming prom, and she has done the window drawings for movies like “Black Panther” at The Strand. Alsup also recently received a scholarship from the Delaware County Arts Festival Association. Alsup has also had two pieces featured in the Governor’s Art Show. 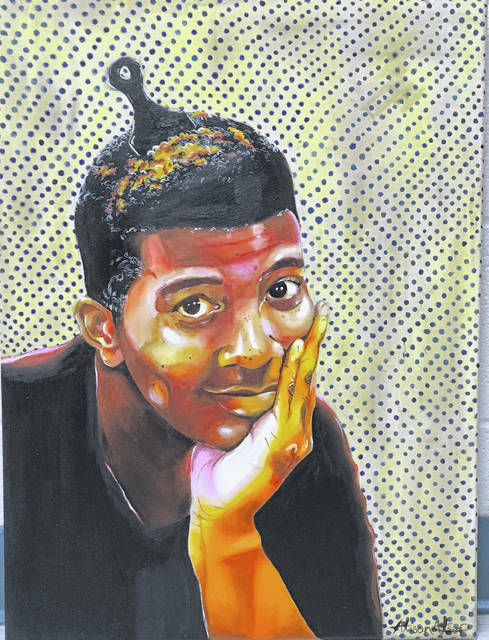 “Self portrait at 17” is featured in the regional gallery, and a portrait of her classmate, Karl Edwards, is featured in the state gallery, which was a surprise to Alsup because it means it was one of the top 300 student art pieces submitted in the state. One of Alsup’s teachers, Lisa Nye, said Wednesday that she is glad Alsup is getting recognition for her work. Alsup said she’s been accepted to several schools, but she has not made a formal decision yet.